The data this week was mixed with no indication of an improving economy. Both retail sales and construction spending were weak when adjusting for inflation. 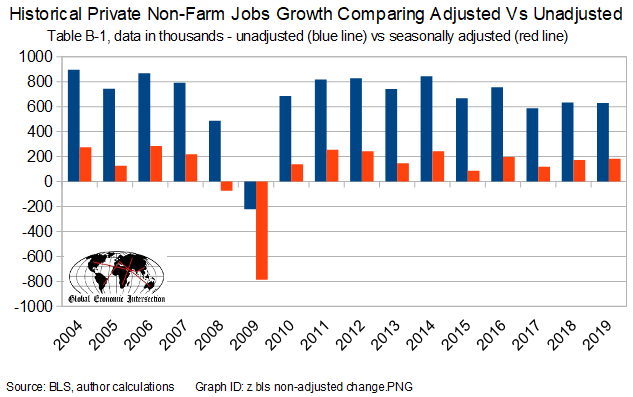 The BLS Jobs Report was strong at face value, but the internals were disturbing. Depending on the inflation indicator used, the general year-over-year inflation rate is in the range of 2%. Generally, this means that for REAL growth, the monetary data point must exceed 2.5% year-over-year for there to be real economic growth. And this week both retail sales and construction spending are contracting if one adjusts the data for inflation and population. 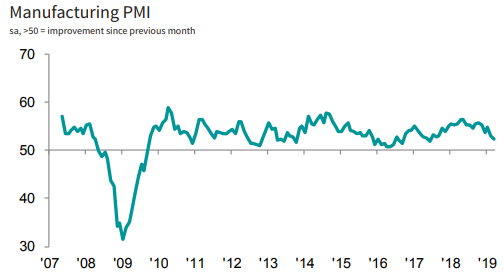 The Econintersect Economic Index for April 2019 insignificantly improved but remains below territory associated with normal expansions. Even with this improvement, the question remains whether this long-term downward trend will continue. Note, our index is built on data sets which were not affected by the government shutdown - and it's most likely that other economic forecasts you have seen fudged the missing data. The following table summarizes the more significant economic releases this past week. For more detailed analysis - please visit our landing page which provides links to our complete analyses. Retail sales declined according to US Census headline data. Last month's data was revised upward but the rolling averages continue their downward trend. There was a significant upward adjustment of last month's data. The real test of strength is the rolling averages which declined. it is not inflation adjusted. per-capita retail sales show NO growth - and this is before any inflation adjustment. The headlines say construction improved month-over-month. Our analysis shows the rolling averages improved. The rolling averages improved - and last month was revised up. However, also note that inflation is grabbing hold, and the inflation-adjusted numbers are in contraction. The Philly Fed US Coincident index year-over-year rate of growth marginally improved - but the index remains above average for values seen over the last two years. The Aruoba-Diebold-Scotti business conditions show below average business conditions. The rate of growth of the Conference Board Coincident Index is stable with little change in the rate of growth. ECRI's Coincident Index's rate of growth marginally declined - and remains below average for the values seen in the last 12 months. The CFNAI rate of growth is below the historical trend rate of growth (zero-line) - and its growth rate is slowing. 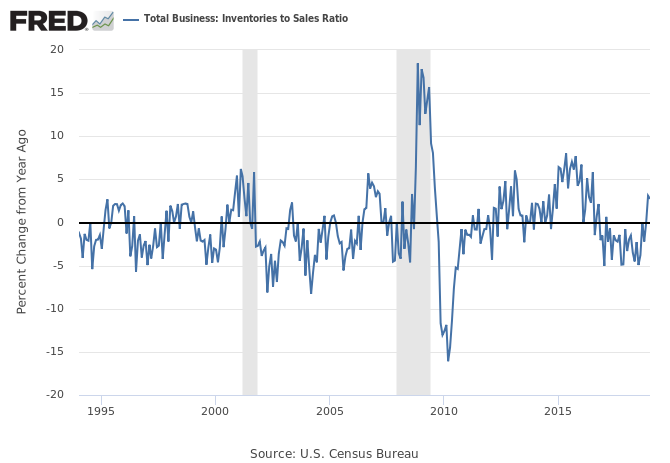 Inventories grew again this month significantly. Our primary monitoring tool - the 3-month rolling averages for sales - declined again but remains in an expansion. As the monthly data has significant variation, the 3-month averages are the way to view this series. Overall business sales are better than the low point in 2015 - but the trend over the last 6 months shows growth is trending down. 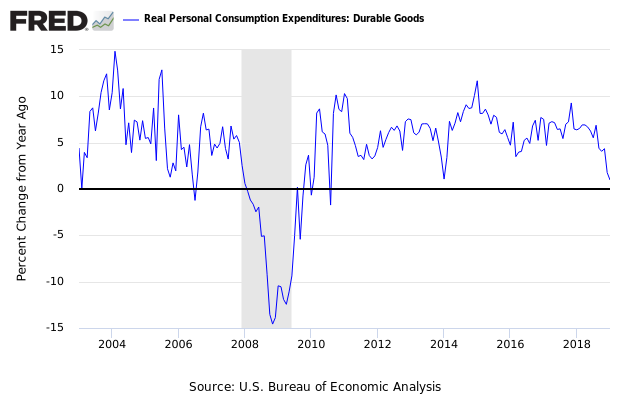 The headlines say the durable goods new orders declined. Our analysis shows the rolling averages continued its decline. In the adjusted data, the weakness was defense and civilian aircraft. This series has wide swings monthly so our primary metric is the unadjusted three-month rolling average - which declined. The rate of growth of the rolling averages is below the values seen over the last year. Note that inflation-adjusted new orders are in contraction. 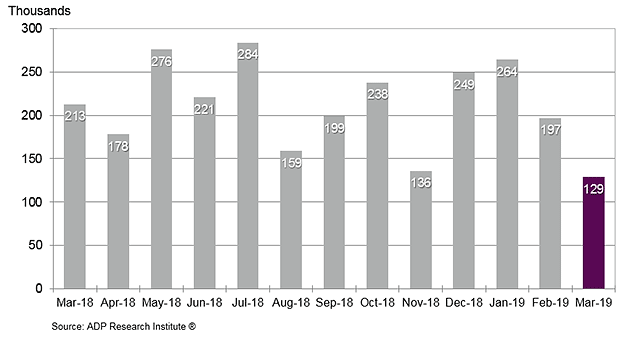 This month the rate of ADPs private employment year-over-year growth is on the low side of the tight range seen over this year. However, the rolling average of the year-over-year rate of growth remains unchanged for the last 7 months. Last month's employment numbers were revised upward. The establishment and household surveys seem to have come from different dimensions. For the second month in a row, these surveys which are the basis of the monthly jobs report do not match with one actually contracting and the other growing significantly. The economically intuitive sectors contracted. The rate of growth of the establishment survey was lower than one year ago. The year-to-date growth remains under last year and worsened. In February, consumer credit increased at a seasonally adjusted annual rate of 4-1/2 percent. Revolving credit increased at an annual rate of 3-1/4 percent, while nonrevolving credit increased at an annual rate of 5 percent. Rail so far in 2019 has changed from a reflection of a strong economic engine to contraction. Currently, not only are the economic intuitive components of rail in contraction, but the year-to-date has slipped into contraction.